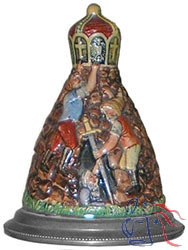 Stoneware, relief, 3.0L, figural inlaid lid. There are no extant Merkelbach records that explain the somewhat cryptic scene depicted on the lid inlay (below right). However, it is almost certainly allegorical in nature and may have well been intended to illustrate Bismarck’s military leadership, providing the “sword” (i.e., military dominance) that led to unification of the German states and formation of the German empire (represented by the crown) under Wilhelm I following the Franco-Prussian War of 1870-71. See also Nos. 1457 and 1458.